Mykonos island is one of the most famous Greek islands in the world and attracts millions of tourists and celebrities every year. The nightlife and the golden beaches in Mykonos are well known for their beauty and endurance, while the Mykonian architecture is certain it will amaze you. The Anna - Maria studios are located in the area of Glastros approximately 2 km from the main town of Mykonos and 1 km from Platis Yialos bay and Psarou beach. 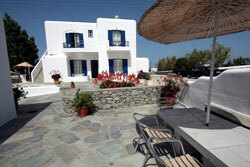 From the Psarou beach you can visit all major and famous beaches of Mykonos by boat. Near your studio / apartment you will find a super market, tavern and a bus station where a bus stops every hour and can take you almost to every beach, village and sightseeing of Mykonos island.Our accommodation facilities include Air conditioning, television, kitchen, private bath, fridge, veranda or balcony, private parking space and every day cleaning services. 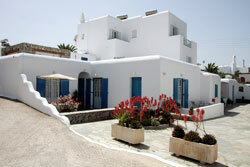 The studios have been fully renovated in 2010 but kept the traditional architecture of the cyclades islands. There are different kind of rooms. Some studios have a view towards the sea and some others on the front side of the facility. 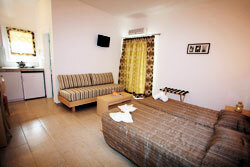 Every studio has its own kitchenette, fridge, A/C, TV, balcony and ofcourse private bath. Please remember to specifically ask a studio with a view towards the sea, if that is your desire. The business is a family business and the owners will help you around the island. Hospitality is one of their expertise and hopefully you will feel as comfortable as you feel in your house. Please note that if you want to avoid the overcrowded season of July and August you can always book a studio with Anna maria studios during May, June, September or October at a very low price.